The arrival of ICT in the city multiplies the capacities to generate and store data useful to local authorities. It is up to them to engage in a policy of open data. local events (fêtes, markets, etc.). 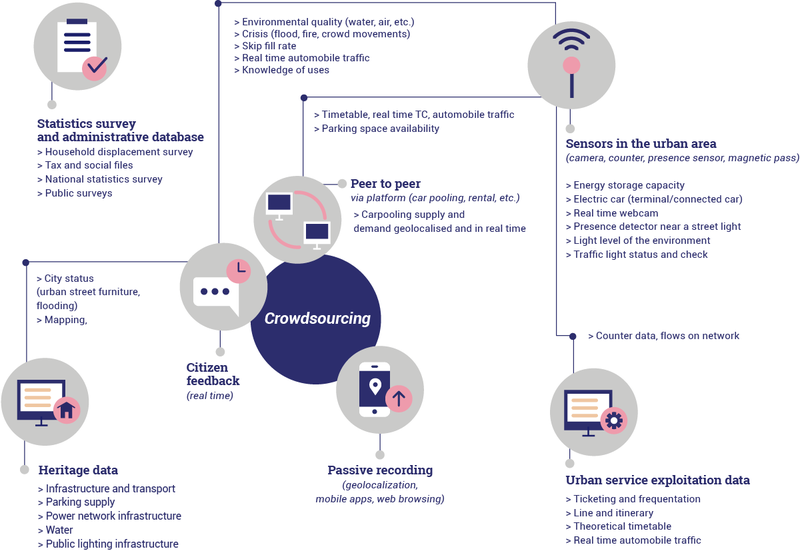 In the case of developing cities, for which local authorities often lack data, recourse to crowdsourcing Crowdsourcing Consists in the use of information, creativity, expertise or intelligence of a large number of people through the intermediary of a platform. From an economic approach, it may be a question of distributing a large number of tasks for the lowest cost. From a collaborative, social or altruistic approach, it is a question of making use of the specialist or volunteer networks of the general public to collect or process information. is an inexpensive solution for collecting additional information connected to reality. Local authorities’ databases must gradually become the central nodes of the entire digital architecture. Whether third party applications, dematerialisation of internal procedures or the sharing of data with the private innovation sector, data structuring, harmonisation and standardisation will be decisive. If a local authority aims to steer governance and uses on the basis of their territorial data, it would do well to build or consolidate its own digitised databases and define the methods for opening internally and externally. This process should improve communication, and therefore coordination, between the authorities and the population, but also between administrations, including the higher levels of government. Exchanges with other local authorities in the country can also allow the adoption of similar procedures to be able to exchange data according to uniform formats. The data available on a territory can be either closed (paying), shared (with a limited number of users and subject to conditions), or open data. Digital data is increasingly considered common property. Opening data means offering everyone, without discrimination, data that is accessible (financially and technically) and usable (without restriction for developing new usages). Open data must be high quality and representative. Making raw data available can enable the development of new services through the intermediary of firms who re-use them to develop digital solutions or to improve their supply of an urban service in the local territory. Each local authority must make a clear choice between the digital data to be shared internally among the departments and those to be made accessible externally. This is how they will design their open data strategy. It is therefore necessary to list, organise and “clean” the existing territorial data before sharing, that is to say building an information system that is clear, consistent, harmonious and organised. The data can be quantitative, but also qualitative in the form of videos, reports, surveys, etc. The data produced according to different sources will take different formats (in terms of time interval, geographic scale, reliability, etc.). Their cross-referencing therefore assumes a work of standardisation to reduce integration costs and avoid being held captive by a technological solution. The databases must also be updated as often as possible, or even, if possible, geo-referenced. They must also be protected and secured. Management, in the end, comprises the integration of scattered data into a single base and cross-referencing the information. This interoperability of data that was previously scattered and incompatible, offers the possibility of a systemic vision of the city and its components, and of highlighting the black spots or creating synergies. In the long term, opening the data supposes the creation of a team dedicated to the task within local authorities. This team shall then be responsible for the quality and integrity of the data within its remit. Data management will become a competence in its own right among those devolved to local authorities and municipalities must prepare for this. There are open digital tools, in particular software platforms that do not require a licence or local server, but a subscription to products that are ready to use and available online. Geographic and cartographic data, urban planning documents (plans, regulations). Minutes of municipal council meetings and regulations. Data from user services (public facilities, hours of opening). Public procurement documents (calls for tender, results). Budgetary and financial data (sector, investment and operating budgets). City statistics, social and economic data. Granting of subsidies (attribution criteria, selected projects). State of urban and social services. A process for standardising geographic data and free access publishing. In Uruguay, from the 1990s, municipal civil servants took the initiative of sharing, public topographic and cartography data free of charge. In order to formalise this process, an open data work group was launched within the municipality of Montevideo in 2010. In parallel, a national law was voted to promote the adoption of free software and open standards in the public sector. This process relied on sets of geographic and transport data in the available formats having already been published on the Internet in open access Open access The making available online of digital content which may itself be free or under an intellectual property regime, but open access. In theory, open access can include access to data to allow data mining. . The conversion and standardisation of public data into open format required specific human resources. This initiative responds to demand from the private sector identified by the municipality to support the development of applications, in particular for tourism (transport, tourist guides, mapping of recyclable bins for example). A working group constituted within the municipality prepared the process and tested an initial, free publication of some data. In a favourable regulatory framework, the publication of public data in open formats allows the private sector to develop applications that meet the inhabitants’ needs. The opening of data is to make files available for the general public. They must be secured. Some of them must also be updated regularly, others in real time: it is on this basis that specialised applications can develop, such as, for example, an application with information on public transport schedules. To be able to make this data available safely and the information remain stable, comprehensible, usable and consistent, it must offer application programming interfaces. They allow third parties to query the databases, then process them to develop applications. In that perspective, the authorities become the information supply platforms from which the start-ups develop value-added services. Developing APIs (Application Programming Interface) pre-supposes confirmed technical skills, dedicated, and specialised teams for design and maintenance. The extra financial and human cost assumes a certain digital maturity on the local authority’s part. theme portals or collective to a territory. The authority’s data could cohabit with other data from public or private sources. A platform for publishing public data and incentives to promote them through digital solutions that meet the inhabitants’ needs. Since 2010, Rennes Métropole and the municipality of Rennes have been using a web platform to publish their public data. 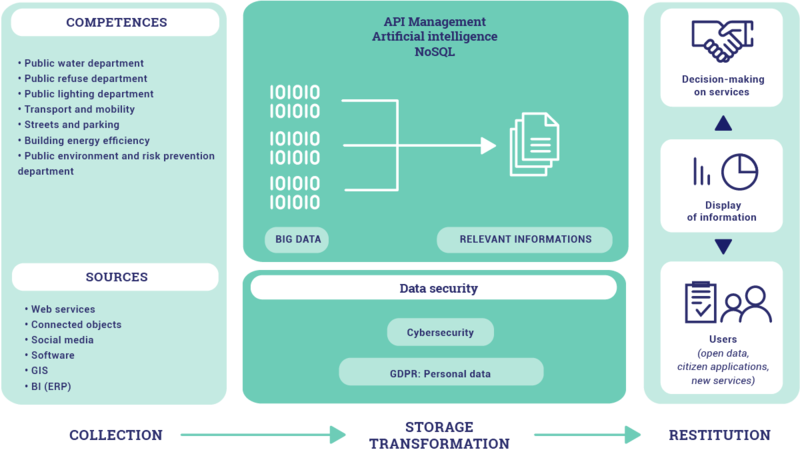 More than two hundred data sets are available there, from local government departments of the Rennes municipality and Rennes Métropole and public or private partners of the territory (Kéolis, Citédia, TransMusicales, Les Champs Libres, etc.). Each data set is associated with display tools to facilitate comprehension: a 3D model belonging to Rennes Métropole was developed to allow simple representation of the territorial public databases (moves, noise management, heat island, creation of light and shade, etc.). This model is accessible on the website and made available to citizens. In order to stimulate data use for local economic development, Rennes Métropole instigated a competition with a prize of 50,000 euros in 2010 and 2011 for developing digital services that meet the population’s needs. Forty-three mobile applications and websites were created; the winner Handimap, for example, is a web application for calculating itineraries for people with reduced mobility. The public authorities encourage here the development of digital services for the most vulnerable population groups. Rennes Métropole and the municipality made data available to contribute to the development of innovative systems for the benefit of the population. In public procurement contracts, Rennes Métropole opted to retain ownership of the data it ordered from its service providers.